1. Butterfly the chicken breasts by slicing each in half through the centre taking care not to cut all the way through, then open out to butterfly. Combine 1 tbsp of the garlic oil with ½ the lemon juice and dried oregano then rub over the chicken and season. 2. Slice the fennel finely, using a mandolin or sharp knife, discarding the tough core and reserve any fronds to use as a herb. In a small bowl mix the crème fraîche with the remaining garlic oil, lemon juice and zest, and loosen with a little water until drizzling consistency. 3. Preheat a griddle until hot, add the chicken and cook for 3-4 minutes on each side until cooked through with no pink meat. Remove from the heat and set aside to rest before slicing into strips. 4. Toss together the prepared fennel shavings with the mint leaves and the watercress. 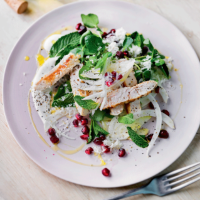 Divide between 2 plates, top with the sliced chicken and scatter over the pomegranate seeds, grated Parmigiano Reggiano and finally drizzle with the sauce and any reserved fennel fronds.